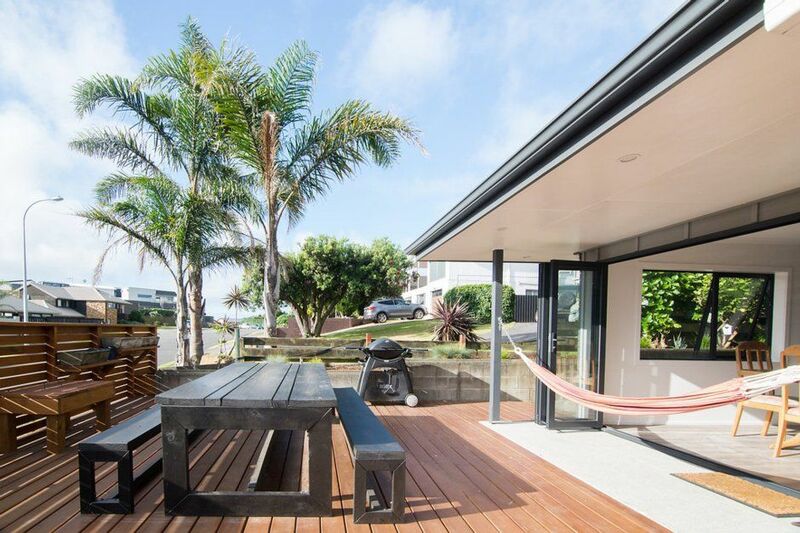 Located in a very sought after street in Mt Maunganui. This house is just a short 5 minute walk to the beach voted No 1 in New Zealand by Tripadviser for 2017 and the fantastic Tay St cafe . Sitting elevated you'll enjoy the north facing sprawling deck made for enjoying those afternoons chilling or an alfresco bbq at the end of the day. The home has recently been stylishly refurbished with a modern kitchen and bathroom. The beds are super comfortable for your enjoyment. Everything is here to make your holiday a memorable experience. Close to Blake park makes this is the ideal holiday home if you or family are competing in events at the park. The house sits in elevated and therefore sunny position. There is open plan living through the kitchen, dining and lounge and the deck opens up from the dining making for a nice indoor /outdoor flow. There are two bedrooms and another bed in the converted garage for extra guests. There is a carport for 1 car and any additional cars may park on the road. Please not one of the bedrooms is in the converted garage. Please give details when inquiring as to whether you are a family group or a group of friends and the ages of your group are. Great location. Close to beach and great cafes. Great location, clean and spacious. Loved staying here, 1min walk to beach. Large living and dinning area leading out to a large wooden deck. Inside is new and tidy. Only one negative was we arrived over some very hot days and we used the house to get ready for my wedding. It was so hot with no air-con we were sweating before we even left. There was only one small fan on a stand we placed in the lounge so would be great if AC was added to the property. With the double glazing wouldn't cost much to keen the house in a good temp through out all the seasons. I would definitely say again. Thanks so much for sharing your house with my family. Beautiful, tidy, great location. Exactly what we needed! Me and my family had a lovely couple of days here. A great spot within walking distance of the beach. Tidy house with everything we needed, great entertaining spaces and a lovely feel to it. We have young children and they had a great time, with plenty of space for them to play. Would definately recommend and would love to come back for a longer stay. Lovely, clean and stylish house. Very handy to the beach and shops. Very tidy, nice and quite and great location.